Earlier this week, Kayvon Afshari, communications director for the American Iranian Council, appeared on Another Thing with veteran broadcaster Larry Mendte to discuss the state of negotiations over Iran's nuclear program and the prospect, in the face of powerful opposition, of a final deal being reached in the coming weeks. While Afshari's pro-diplomacy optimism was backed up by important facts not often heard in the media, Mendte made a number of comments that betrayed his role as an ostensibly objective and informed interviewer. Right off the bat, for instance, Mendte describes the ongoing talks as a negotiation about an "Iranian nuclear arms deal." That's a bizarre - albeit revealing - way to begin, namely because that's not what this is. If anything, the Nuclear Non-Proliferation Treaty (NPT) is a nuclear arms deal, one signed back in 1968 by Iran and ratified two year later, as it proscribes all non-nuclear weapons signatories to forever forgo the acquisition of nuclear weapons. What Iran is negotiating with six world powers about is accepting verifiable limits and constraints on its peaceful, civilian, non-weaponized, non-military, safeguarded nuclear energy program in exchange for the lifting of international and unilateral sanctions and the normalization of its nuclear dossier. This is not an "arms deal," as Iran has no "arms" to give up. The United States intelligence community and its allies have long assessed that Iran doesn't even have a nuclear weapons program, let alone nuclear weapons. Iranian officials, for decades, have consistently maintained they will never pursue such weapons on religious, strategic, political, moral and legal grounds. The IAEA has found no credible evidence that Iran has ever had a nuclear weapons program. The way I understand the deal, and I think some of the people that are critical of it, is that there'd be a decade-long moratorium and then, the president has admitted in an article, in an interview, that after that decade-long moratorium, Iran could start up a nuclear program just like that. As a matter fact, they could advance the program during that decade and then be able to start up, for 10 years. This just puts off the inevitable. Is that fair? Obviously this is not "fair" and Mendte's understanding of the deal, or anything having to do with Iran or its nuclear program for that matter, is effectively nonexistent. Afshari rightly points out to Mendte that Iran already has a nuclear program, one that is legal and guaranteed under the NPT, also noting, "It's not as though there's going to be no inspections after ten years. There's still going to be strict inspections, but they'll be loosened after that initial ten years." Mendte is quick to jump in. "We had strict inspections in Iraq. That didn't turn out really well," he patronizingly tells Afshari, continuing, "The reason we went into Iraq, people forget, in the first place, is because the inspectors were thrown out and not allowed in. [There were] supposed to be UN inspections and he [Saddam Hussein] didn't allow it." When Afshari replies that the analogy is a stretch as Iran has never kicked out inspectors and that Iraq's nuclear program was very different than Iran's, Mendte is undeterred, insisting on playing out his analogy. "There was a nuclear arms deal in place" before the U.S. invasion of Iraq in 2003, he says, "and what I'm saying is that lead to the Iraq War. I mean, I know there [were] other factors including 9/11, including President Bush wanting to go after Iraq, but that was the catalyst: the fact that they left out UN inspectors, if you remember at the time." While Afshari is a gracious guest and tries to steer the conversation back on track, he really shouldn't have been so accommodating to Mendte's version of history. Basically, he should have told him he was flat-out wrong. Beyond the fact that Mendte seems to have forgotten that Bush administration claims about Iraq's weapons of mass destruction were false (and that there was no "nuclear arms deal in place" with Iraq), his claim about international inspectors is also completely bogus. How so, you ask? Saddam never kicked inspectors out of Iraq. This claim is a canard, a wholesale myth, a straight-up falsehood. It was built up by the Bush administration to justify the invasion of Iraq and dutifully reinforced by the mainstream media. In fact, between late November 2002 and mid-March 2003, weapons inspectors from the IAEA and the U.N. Monitoring, Verification, and Inspection Commission (UNMOVIC) conducted more than 750 inspections at 550 sites in Iraq. In January 2003, UNMOVIC chief Hans Blix told reporters that inspectors had been "covering the country in ever wider sweeps" for months but "haven't found any smoking guns." An Associated Press dispatch from the time noted, "In almost two months of surprise visits across Iraq, U.N. arms monitors have inspected 13 sites identified by U.S. and British intelligence agencies as major 'facilities of concern,' and reported no signs of revived weapons building." IAEA Director-General Mohamed ElBaradei delivered a report to the U.N. Security Council on March 7, 2003, during which he spoke of increased Iraqi cooperation with international inspections and thoroughly dismantled Bush administration claims about aluminum tubes, high-strength magnets, and importing yellowcake from Niger. ElBaradei concluded, "After three months of intrusive inspections, we have to date found no evidence or plausible indication of the revival of a nuclear weapon program in Iraq" and clearly stated the intention "to continue our inspection activities." Inspections ended abruptly eleven days later, on March 18, 2003, for one reason: the United States was about to start dropping bombs all over the place. "In early March," Glenn Kessler of The Washington Post's "Fact Checker" blog wrote in 2011, Blix "began getting warnings from senior U.S. and British officials about the safety of the inspectors. Then the company that supplied helicopters for the teams withdrew its equipment from Iraq." News reports at the time leave no doubt as to what really happened. Mohamed ElBaradei, head of the International Atomic Energy Agency, said the recommendation was given late Sunday night both to his Vienna-based agency hunting for atomic weaponry and to the New York-based teams looking for biological and chemical weapons." "Late last night... I was advised by the U.S. government to pull out our inspectors from Baghdad," ElBaradei told the IAEA's board of governors. Within hours, the evacuation began. "U.N. weapons inspectors climbed aboard a plane and pulled out of Iraq on Tuesday after President Bush issued a final ultimatum for Saddam Hussein to step down or face war," AP reported the next day. "U.N. Secretary-General Kofi Annan on Monday ordered all U.N. inspectors and support staff, humanitarian workers and U.N. observers along the Iraq-Kuwait border to evacuate Iraq after U.S. threats to launch war." "[A]t no time did Iraq throw out the inspectors," wrote Kessler, in an attempt to forever put these talking points to rest. "[I]nspectors voluntarily ended their mission because of the threat of military action by the United States and its allies. Larry Mendte's regurgitation of Rumsfeldian propaganda - 13 years after the illegal and disastrous invasion of Iraq - should cast doubt on his credibility as a broadcaster. Let's hope a correction and mea culpa are forthcoming - not to mention an apology to Afshari. May 10, 2015 - I guess I shouldn't have been surprised by Larry Mendte's inability to grasp basic facts. A quick look at some of his past rants on Iran makes clear he's long bought into the most bellicose and alarmist propaganda pushed by Iran hawks and is incapable of any semblance of critical thought. He sees the U.S. invasions and occupations of Afghanistan and Iraq as warnings to other nations, not as lessons to be learned about jingoism, faulty intelligence, war crimes, and imperial adventurism. He thinks Iran has a "nuclear weapons program." He thinks sanctions "brought Iran to the negotiating table." He says he knows that Iran wants a nuclear bomb. 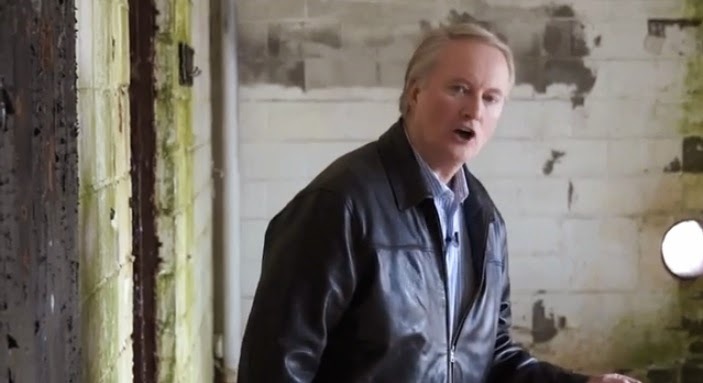 Larry Mendte bloviates like he's in a Darrell Hammond sketch. With one exception: he should be taken far less seriously.